Technically, my ten-year-blogoversary was yesterday, but I didn’t get my act together in time to post this, so I’m a bit late. I don’t mind. I started my blog on Valentine’s Day, in the wee early hours of the morning while I suffered from jet lag after returning from my sister’s wedding in Palestine, but I wrote my first book review on the 15th, so today’s as good a day as any. As many of you know, I’ve not always been the most consistent blogger. When I get knocked off course, I have a tendency to bounce around wildly like in a pinball machine until I settle. 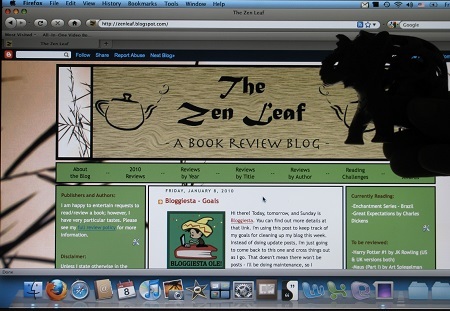 From mid-2011 until August 2014, I could not tell you how many times I switched blogs, quit blogging, blogged only privately, etc before reopening The Zen Leaf. Once I settled, I was fine. For a few years, though, I pretty much lost 95% of my readership, and honestly I’ve never been keen to be as big a blog again as I was before quitting. I’m perfectly happy with my little corner of the blogosphere! That’s not to say that I haven’t gotten things out of blogging, both on a larger scale and my current smaller one. It’s been a wonderful decade, full of wonderful things and wonderful people, and I’m still doing what I love: writing my way through the world as a way to connect with like-minded people. Blogging has always been about friendship to me, and ten years on, this is still the most important thing! So, in the last ten years, here are some fun facts and highlights! Books read/reviewed: just over 1000! I’ve still never read a book with a title that begins with an X, though I’ve read authors with last names beginning with every letter of the alphabet! Reading challenges (whether host or participant) – These restricted my reading too much! The one exception is the annual RIP challenge! Graphic novels – While I enjoy a very small percentage of these, I prefer my books in prose form. Readalongs (whether host or participant) – I have a difficult time reading only a small segment at a time when I have the full book at my disposal. Joint reviews – Fun idea, but the execution made me anxious! Book tours and review books – While it’s sometimes fun to get a book ahead of time, I find that I cull too many books and this makes me feel guilty. Ratings – I used to star-rate my books but found that ratings changed over time or were too static/single-minded for me. Vlogging – I love watching others’ vlogs but prefer writing myself. Readathon! – I haven’t gotten to participate as much as I’d like, but I love this event so much! New genres – Without blogging, I’d probably still be reading only classics and Harry Potter! Through book blogs, I’ve discovered so many of my favorite authors, genres, and books. Audiobooks – I used to think I disliked audiobooks and boy how wrong I was! GoodReads – This is like a reader’s paradise! Especially if you’re a list-fanatic like me. Culling and abandoning books – I used to never give up a book once I started. Now I regularly abandon books at any point, from the first few paragraphs the last chapter. Life’s too short! Wider blogging – In the beginning, my blog was all-books-all-the-time and I’ve discovered that I like a more free-range style. Slower reading – In the early days of blogging, it was not unusual for me to read/review around 200 books per year, which burned me out really fast. I eventually settled into a good rate for me, around 60-80 books per year. Multi-reads – This was something I did pre-blogging and had to rediscover. Sometimes it’s okay (and great!) to read a book twice (or twenty times) in a row. The Return of the Native – I didn’t used to think I liked audiobooks until I stumbled across this one, read by Alan Rickman (mmm), and my entire book world changed. The Omnivore’s Dilemma – This is another book that changed my life, teaching me an entirely different way to view nutrition, especially fresh produce. The Night Circus – I’ve wanted to be a writer/author my entire life, until one year when I was so discouraged that I actually decided to quit. Nine months later, I read this book and changed my mind. NaNoWriMo – It was book bloggers that first introduced me to National Novel Writing Month, and book bloggers that encouraged me to participate. Brandon Sanderson – Sanderson wrote a NaNoWriMo pep talk one year that was so good I just had to read one of his books. He wrote in a genre I didn’t ever read – traditional fantasy – but his books helped me to fall in love with the genre and he’s now my favorite author ever. Library-Palooza – Speaking of Brandon Sanderson, I got to meet him and several other authors at this event in 2016! BEA and other book events – Book Expo America, Book Blogger Conference, Texas Book Festival, Library-Palooza…etc. I’ve been to a lot of these events over the years, often meeting up with other book bloggers for them. Community – I’ve met dozens and dozens of bloggers over the years. Since blogging has always been about friendship for me, these meet-ups are one of the best things about creating The Zen Leaf all those years ago. Support – I’ve gone through quite a number of rough times over the last decade, most notably the awful year I was in Boston. A select group of close blogger friends, as well as other friends and family, made up an online support group that kept me safe and sane through that year. Last but not least, I couldn’t celebrate this blogoversary without highlighting several of my favorite books from over the years. I couldn’t pick just ten favorites – gah! out of a thousand?? – so instead I’m going to list a few favorites from each year since The Zen Leaf began. If you are still reading (this post, this blog…), thank you. To all my blogger friends out there, thank you. I can’t even imagine what my life would have been like these last ten years without all of this and all of you. Congrats on 10 years–quite an accomplishment! Happy anniversary! I would never have begun blogging if it weren’t for you. And I’m happy to see some of MY favorite books on your list of highlights. Also I’m so sad about Death! 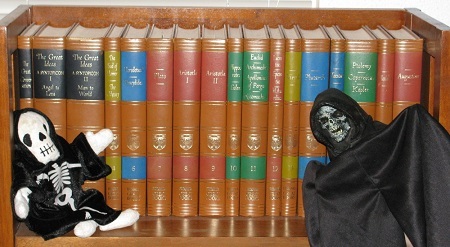 I miss the Death and Baby Death Book Hour. Are all the videos on YouTube? They are, though I’m not sure if they’re searchable or not. I’ll have to gather some links to mail you. I remember that original banner! Ah, the memories. It still makes me sad that Death died. I always looked forward to those videos. I had to go and check my own archives to confirm – no X authors or X books for me. Boo!! Here’s to the next ten years, my friend! I read Sky Burial by Xinran back in my early years of blogging, which was a fascinating look at nomadic Mongolian and Chinese culture. It’s crazy to think how much things have changed over the last decade in terms of the blogworld! I love the way you looked back through the years and, wow : that picture of your old blog hit me right in the nostalgia! Your blog was one of the first I discovered and started to follow, and then, through the years, I hopped along your way through your different homes. I want to say thanks for sticking with me as I moved around all those years! I know so many people just lost track of me altogether, and many of them have moved away from blogging altogether, which makes me sad on both counts. I remember back in those early days when you and I were geeking out about both knowing Manau after I put a video up during one of my Readathon posts, haha! Congratulations on your decade of blogging! This helped me reflect and ask myself why I want to blog and write. I just got over the “no one would want to read what I have to say” or “there’s nothing for me to say, everyone is doing all the talking already” kinda thing. I’m still figuring it out, but stumbling upon your post here gave me encouragement to fearlessly explore what I can create and experience with my blog. 🙂 Thank you!